I admit I am struggling a bit today. I keep seeing pictures of black cats on social media along with the information that it is Black Cat Appreciation Day. 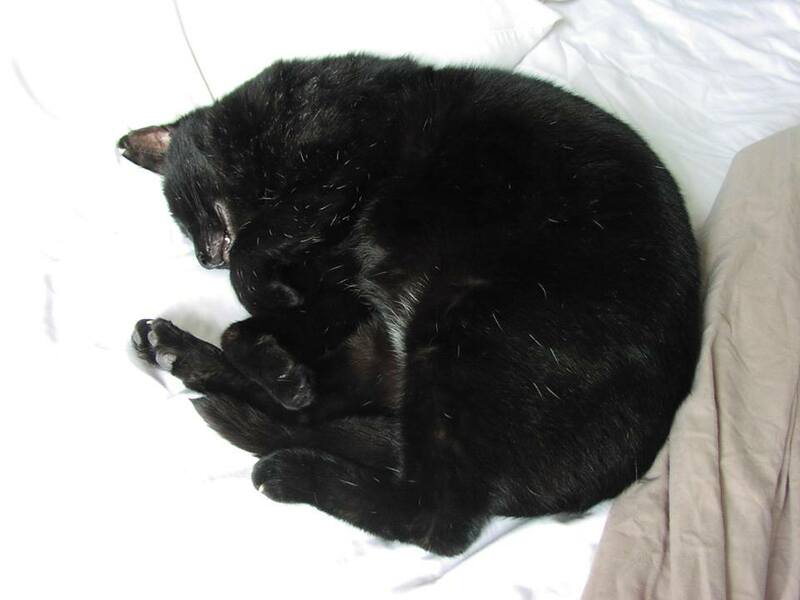 My own darling black cat Pharaoh died only a few days ago and I miss him so much. Here is one of the few pictures I took of him in the brief time he was my companion on this earth plane. Since he died, I have seen two small white feathers in the garden. According to folklore, white feathers can be a message from a loved one who has passed into the spirit world. Happy hunting in the Summerlands, Pharaoh. The gifts are appreciated. I found a white feather when my Miss Minga passed. It was lying right near where she used to lay when I was sitting at the kitchen tale. Watch for more signs. I had quite a few in the early days. A cloud in the sky shaped as a cat, a rainbow at my feet while waiting for the bus one day and there hadn't been any rain, clumps of her fur lying next to the computer, and most telling, a picture on my phone which appears to come from over the rainbow bridge. I saved pictures of all, including the one on my phone. My condolences. It might be hard right now but I find the best thing for that kind of heartache is a new pet. Not to forget your recent one but to have another one onto which you can bestow your love...it's a great way to heal. Thanks! I should have photographed the feathers - you are right mxtodis123. P.E. Cor - I will adopt another cat, probably in a month or so when I feel I have had enough time to grieve. Thank you. I think they were. Thank you - it does mean a lot to me that you say that.